Bitcoin Video Casino, which currently bears the message that it is for sale, is one of the oldest and unique bitcoin online gambling sites in the industry. It is the only bitcoin online casino in the industry, which gives players the opportunity to play Vegas style video machines. Several online casino players like playing with video machines. Well aware of this fact, Bitcoin Video Casino offers players a wide range of slot machine games, making them feel as if they are at a brick-and-mortar casino in Las Vegas. Players like Bitcoin Video Casino because they can start playing without having to register a real player account. Another wonderful feature of the online casino is that it offers a payout percentage of 99.5% for all games. In addition, winnings are paid our instantly and a mobile side product is available. 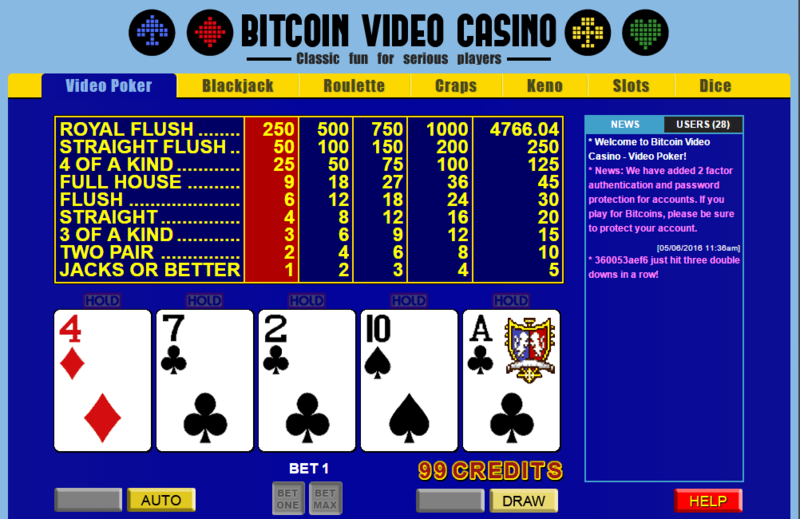 Since the bitcoin online casino has a user friendly interface, it is very easy to navigate. The gambling experience at Bitcoin Video Casino is 100% fair although players can play anonymously. Registration is very easy, requiring players to only bookmark Bitcoin Video Casino or copy its URL in order to access it in future. The games are all provably fair. Although players will not get any bonuses at Bitcoin Video Casino, they can benefit greatly from its lucrative referral program, which offers as much as 25 percent of the house edge to those to refer players to the site. If players refer other players to the site, they will earn commissions based on their referral’s wins and losses. Players do not even have to spend money to play at Bitcoin Video Casino. They can play with fun money without even revealing their identity. If anonymous gambling is what players are looking for, they will definitely find it at Bitcoin Video Casino. Players can play for free using test credits as long as they wish. Whenever they feel like playing for real money, they can send some bitcoins to the address displayed at the bottom of the screen. Before playing at Bitcoin Video Casino, players have to confirm that gambling is indeed legal in their country. Recently, the casino included 2-factor authentication and password protection for player accounts. The casino urges bitcoin players to protect and secure their accounts if they are playing for real money. One of the best features of Bitcoin Video Casino is that it allows players to play on the move. To get started, players can either scan the QR code on the casino website with their mobile devices or download the Android APK file from the casino website. The mobile Android bitcoin casino portfolio is packed with blackjack, Bitcoin video poker, dice, and slots games. It can be easily integrated with players’ Android bitcoin wallets so that it becomes easy for them to load their accounts and withdraw winnings in bitcoins. They can withdraw winnings instantly by scanning their bitcoin address QR codes with their mobile devices.